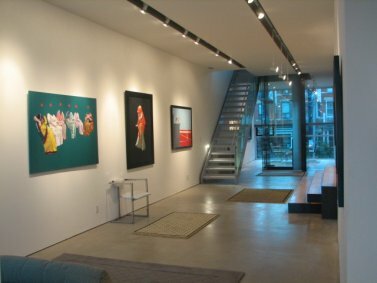 Charles Pachter created a unique home and live-in studio which is now an extension of the Moose Factory (the Moose Factory is where Charles Pachter shows his artwork and paints). This contemporary architecture in the heart of china town, near to the ROM and AGO, has been featured in Toronto Star and Toronto Life. Golden Hammer Renovations was the general contractor, working with Teeple Architects to fulfill Charles Pachter's vision. More Information three long spatial volumes stacked on top of each other, shifted laterally and longitudinally to allow light penetration into the spaces. The ground floor is the studio, the second floor the gallery and the top floor is the residence. Recently added A hot tub and deck. Designed with Joe Caravaggio and architect Stephano in hand, the vision was to build a cape cod style home in the midst of North York, bringing back the authentic originality of these homes. Click here...>> to find 63 Katherine with Google maps. We built the owners dream home out of a century old home that been converted into a rooming house; Golden Hammer Renovations made the owners vision come to life. A great deal of re-engineering was required, in particular the rear and front additions. Because of the open concept, 22 steel beams had to be brought into this home. 210 Poplar Plains was featured in Toronto Life in June, 2009. Tea room, 2 wood burning fireplaces. The main floor is open concept with kitchen, dining room, living room, library. Front porch is heated for wintertime. Click here...>> to find 210 Poplar Plains with Google maps. Some entrepreneurs that were in the business of purchasing, renovating and selling homes. 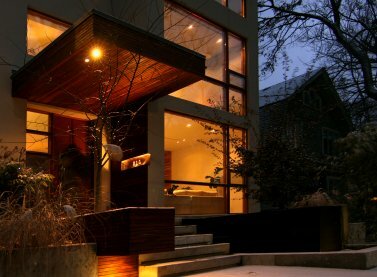 They came up with design concepts, modern contemporary style home. Designed by Dean Levitt Goodman. Concrete floors, concrete counter tops, green roof (garden), foam insulation, high R value. Windows were imported from Germany. Custom designed staircase. Click here...>> to find 456 Clinton with Google maps. No furniture. Everything built in... couches, shelving, chairs. geothermal. High R calue windows imported from germany. Atrium in center of house, that generates alot of natural lighting. Click here...>> to find 625 Clinton with Google maps. This is a new home we built for the same owner of 58 Garnet rear laneway house. 58 Garnet was recently on TV talking about the real-estate market. Click here...>> to find 58 Garnet with Google maps. This is a laneway home with a tank less water heater used for domestic hot water and in floor radiant heat. It is 1,200 sq. Ft and cost $35.00 a month in heating cost. It is also built for a green roof that will be added in the near future. It was on CTV news. This is a new home in a ravine lot. The back of the house is all glass from floor to ceiling and overlooks a ravine. The windows are a commercial grade curtain wall glazing. The home now has glass pocket doors. It also has a steel stair case that was welded on site. Environmental: This home also has geothermal heating and cooling. A high R value foam insulation was used. It also has a green roof. 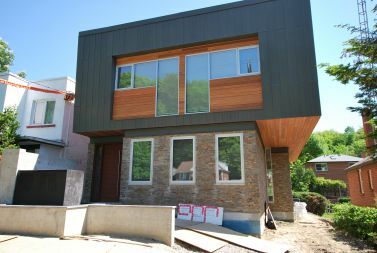 28 Beaucourt is now completed. Click here...>> to find 28 Beaucourt with Google maps. There is also operable sky lights for air circulation. Click here...>> to find 99 South Kingsway with Google maps. 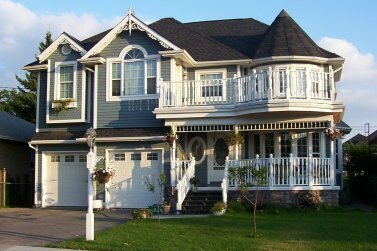 Renovations to porch, objective was to bring a traditional look, with natural curves that would give this home character and individuality.